A unity dish--in Cataluña, everybody eats canelones during the holidays. My homage to Cataluña is, as you might expect, a culinary one. I joined with millions of Catalans the day after Christmas in eating canelones. Yep, filled pasta tubes, a traditional Catalan dish for the day of San Esteban, December 26. Dinner might be the only thing the Catalans can agree on. 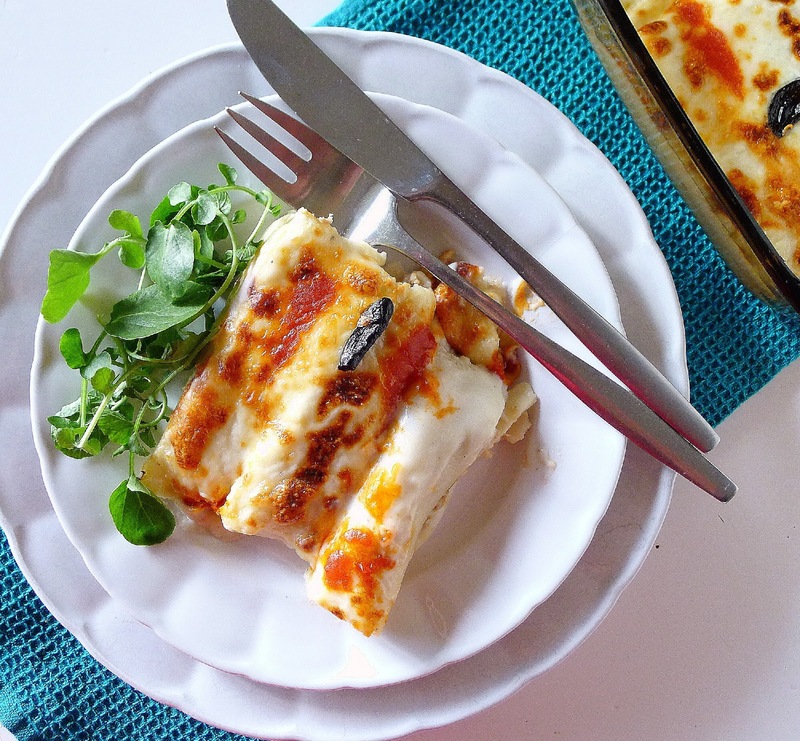 Whether you’re an independista or not, speak catalan or castellano, canelones are on the menu. Cataluña-Catalunya-Catalonia (the region of northeast Spain encompassing the provinces of Barcelona, Girona, Lleida and Tarragona) declared itself an independent republic back in October, following a referendum (illegal, according to the national constitution) in which a majority (with only 43 percent voter participation) voted to secede from the kingdom of Spain. The declaration of independence precipitated a constitutional crisis. The central government in Madrid, which had tried to prevent the referendum, invoked an article of the constitution that allowed it to impose direct rule over Cataluña and call for new elections. The elections took place right before Christmas, December 21. Voter turn-out was an amazing 82 percent. But, to the distress of the central government’s ruling party, the independistas still hold a slim majority (the three separatist parties won 70 seats in the Catalan Parlament; the combined unionist parties that want Cataluña to remain part of Spain won 65). What happens next is unclear. Spaniards all—including the Catalans—are occupied with holiday festivities, so the crisis has somewhat receded. (The holiday does not wind down until January 6, el día de los Reyes Magos.) Then we shall see. Meanwhile, have another serving of canelones. Canelones (canelons in Catalan) became popular in Cataluña in the 19th century. The filling originally was made with leftover cooked meat, poultry and sausage from the escudella i carn d’olla, the grand one-pot meal traditionally served on Christmas day (the Catalan version of cocido). Pasta squares are rolled around a filling of three kinds of meat, then topped with béchamel sauce and grated cheese. Instead of truffles, I've added cloves of black garlic. Not just for San Esteban day, serve these cannelloni any time. 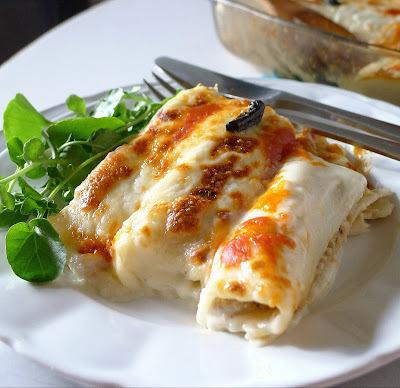 The cannelloni can be filled and rolled and the béchamel sauce prepared in advance. 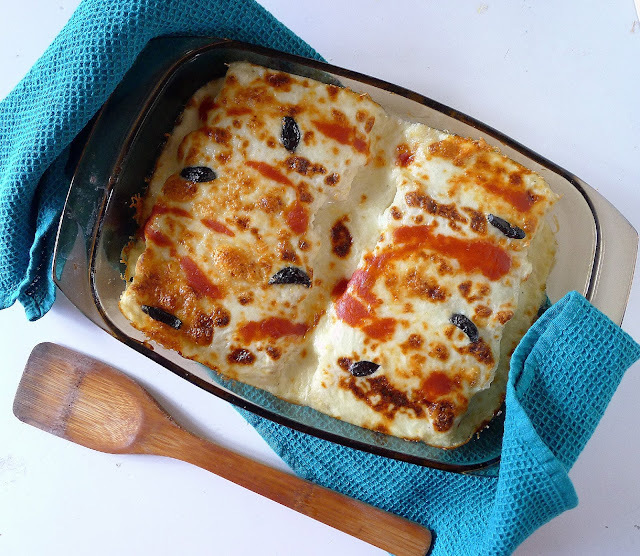 Place the filled cannelloni in the oven dish with sauce, without adding the grated cheese, and refrigerate. Bring to room temperature before adding cheese and baking the pasta. 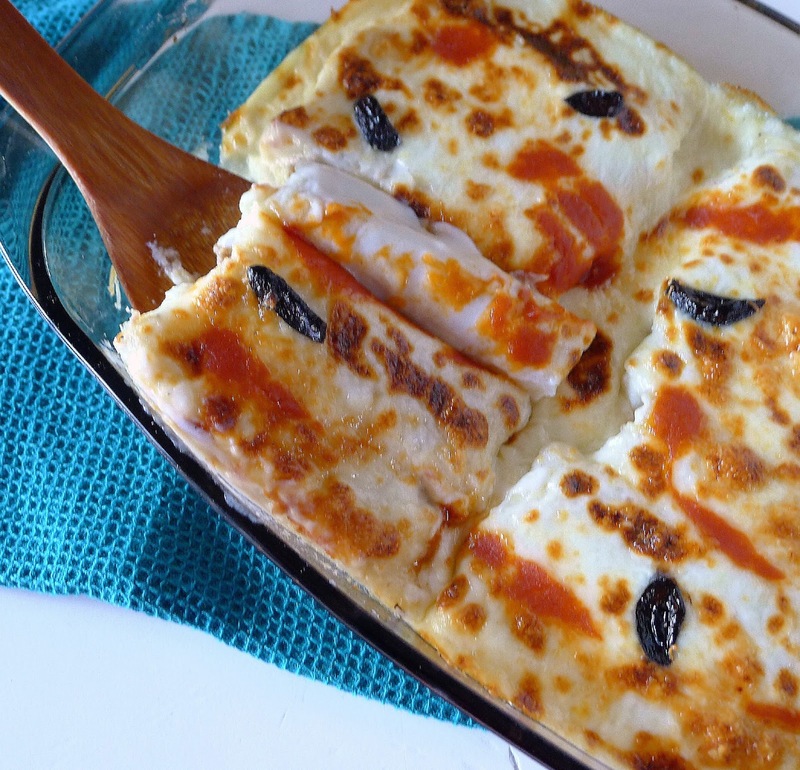 Restaurant versions of Catalan canelones often are finished with shaved black truffles. I had no truffles, but studded the sauce with cloves of black garlic. 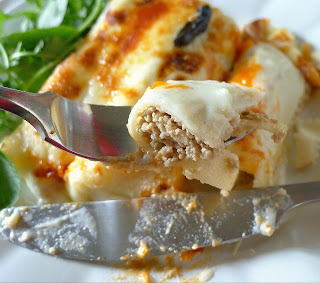 Should you have more of the meat-chicken filling than you need to fill the cannelloni, spread it on toast, add a pickled onion and call it pâté. Veal, pork and chicken cooks with brandy. Heat the oil in a skillet and sauté the onion and garlic on medium heat until softened, 3 minutes. Add the pork and veal and continue sautéing 5 minutes. Add the diced chicken and sauté 5 minutes. Add the liver and sauté 5 minutes. Season with salt and pepper. Add the brandy and cook 3 minutes more. Stir in the parsley and 1 tablespoon of tomato sauce. Grind this mixture in a food processor. Place in a bowl and add chicken stock a few tablespoons at a time to make a smooth mixture that is moist, but stiff enough to be shaped into logs. 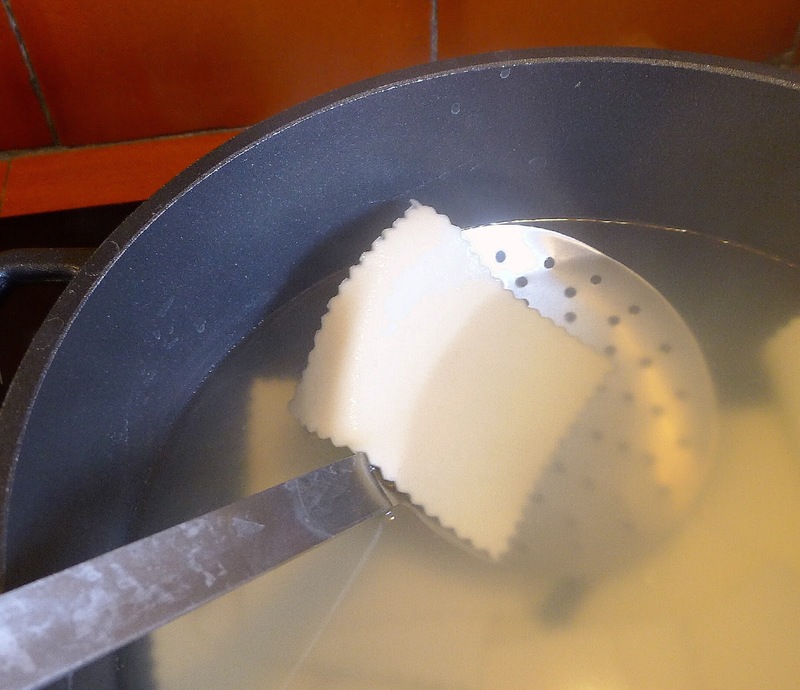 Cook squares of pasta, skim out and place on kitchen towel. Roll the pasta around a log of the meat filling. Lightly oil an oven-safe gratin dish. Spread some of the béchamel sauce in the bottom of the dish. 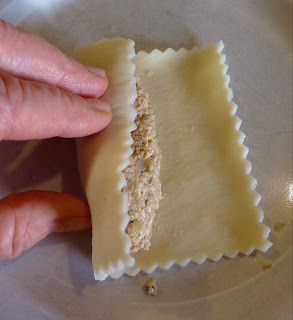 Working with one sheet of pasta at a time, place a log of the meat filling on it and roll the pasta around the filling. Place the filled pasta roll in the dish. Continue, using all of the pasta squares. 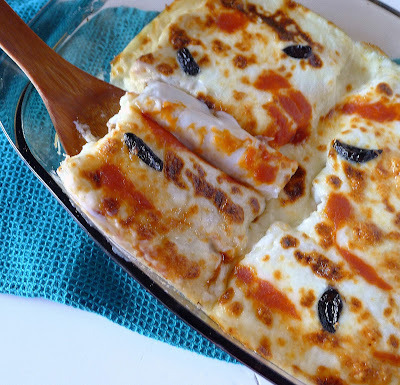 Nap the cannelloni with remaining béchamel sauce. If desired, make squiggles of tomato sauce on top of the rows. Stud with truffles, if using. Sprinkle grated cheese over the top. Sprinkle with pimentón, if desired. If making the sauce in advance of using with the cannelloni, cover the surface with plastic wrap and refrigerate. Heat the sauce slightly and whisk it smooth before spreading in the oven dish for cannelloni. Heat the oil in a saucepan. Stir in the flour. Cook it on medium heat, stirring, for 3 minutes. Do not let the flour brown. Whisk in the milk. Continue stirring or whisking until the sauce thickens. Season with salt, pepper and nutmeg. Cook the sauce 10 minutes. I may be dining alone on Christmas. One branch of my family lives across the pond in the US. My grandson in Spain goes to his other grandmother’s for Christmas. My friends are out of town. If the surf’s up, son Ben will be on the waves. I’m fine with that. I’ll still make myself a lovely meal and open a bottle of good wine. 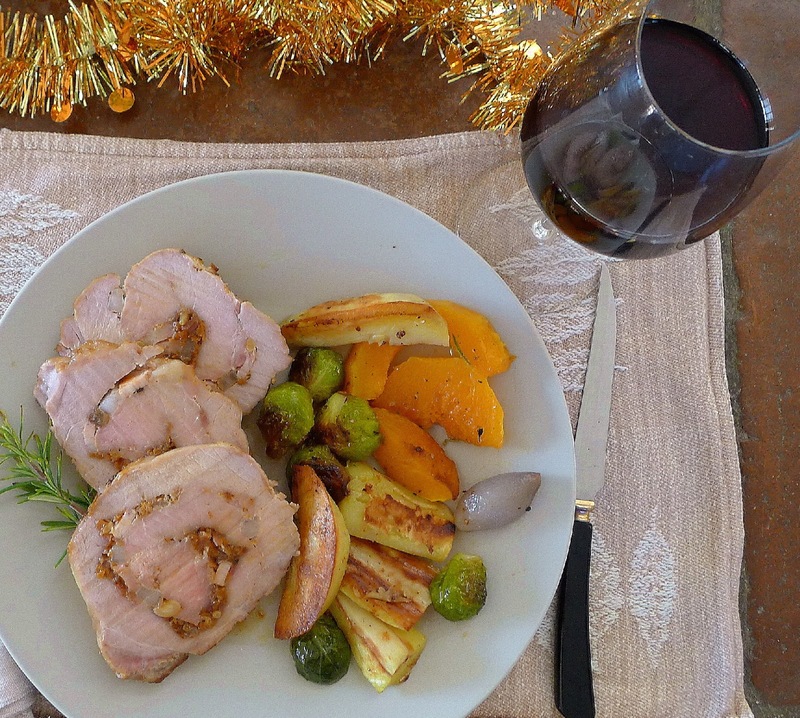 Festive dinner for one: stuffed pork loin with easy oven-roasted vegetables. Some years I plan a menu just for one—a single duck breast, a one-woman serving of shrimp. But this year I found inspiration at the local market, where the butcher was taking orders for lomo relleno, oven-ready stuffed boneless pork loin. He gave me some tips on how to butterfly the meat. 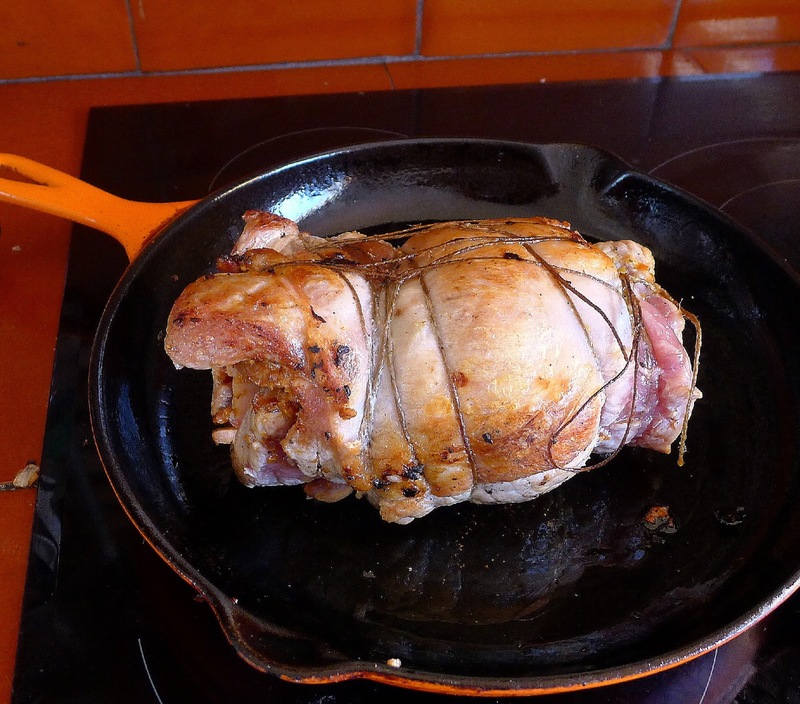 He suggested including strips of tocino ibérico--ibérico pork fat--to help keep the meat juicy. 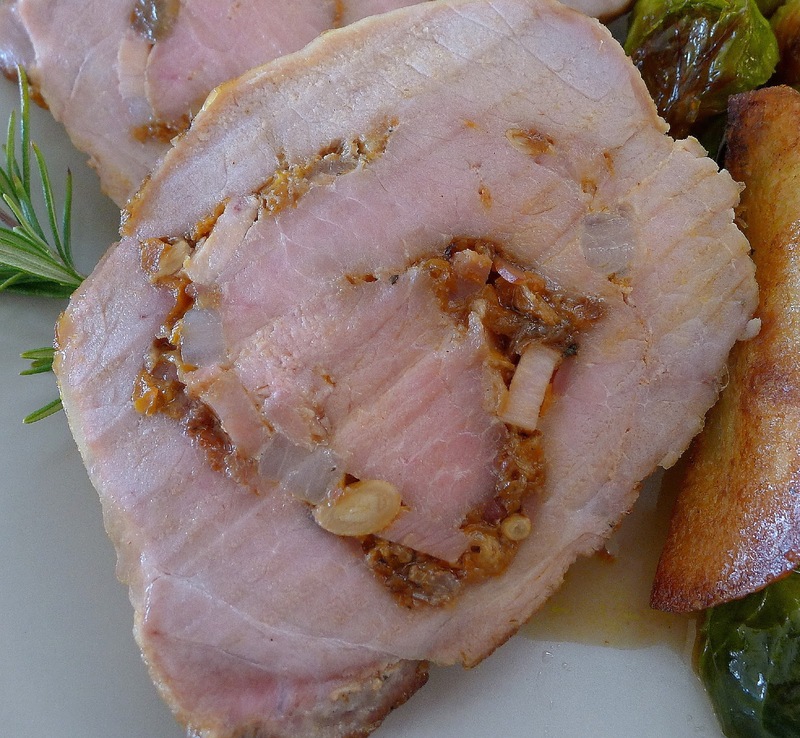 Pork loin is a versatile cut—scale it up or down. I bought a fairly large piece, enough for my dinner and a festive post-Christmas dinner when the family reassembles. I'm pouring a good wine--a fruity Syrah pairs nicely with pork. 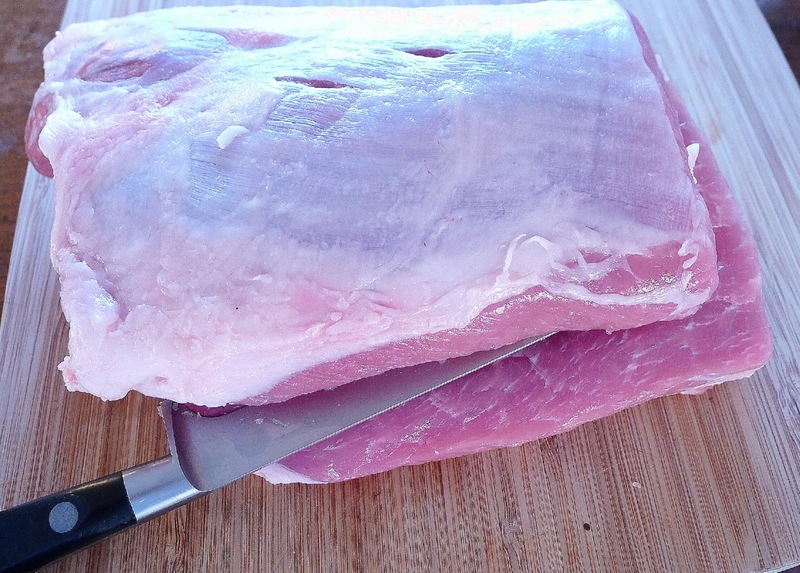 Sliced pork loin shows nuggets of pork fat (or bacon) that help keep the meat juicy. If possible, have the butcher butterfly the piece of pork loin for you (his or her knives are probably sharper than yours). If you’re doing it yourself, here's how. Place the meat fat-side up. Along one long side, cut horizontally almost through to the other side. Open the meat like a book. Starting in the center (the “spine” of the book), make a flat cut towards one outer edge, without cutting all the way through. Open that flap. Starting again from the center, cut horizontally to the other side, without cutting through. Open the meat up. You should have a more-or-less rectangular slab of meat consisting of four flaps. Step 1: Place the meat fat-side up. Along one long side, cut horizontally almost through to the other side. Open the meat like a book. Step 2: Starting in the center (the “spine” of the book), make a flat cut towards one outer edge, without cutting all the way through. Open that flap. Step 3: Starting again from the center, cut horizontally to the other side, without cutting through. Open the meat up. 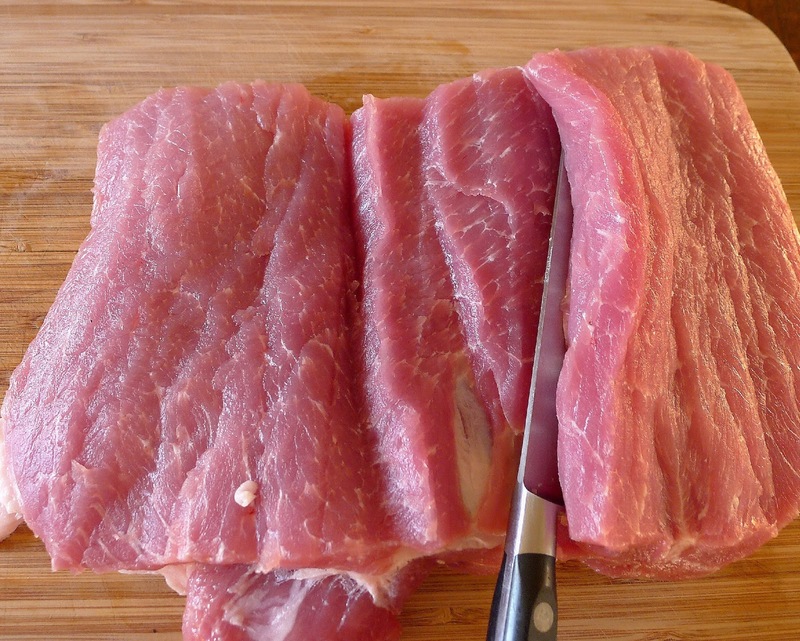 You should have a more-or-less rectangular slab of meat consisting of four flaps. Cover the meat with plastic wrap and pound with a meat mallet to even out the thickness of the slab. The ingredients given are for a 2 ¾- pound boneless loin. For a smaller piece of meat, cut quantities in half; for a whole loin, double the ingredients. Serves 6-8 (or 1 or 2 with lots of leftovers). The day before roasting the meat: Open up the meat and sprinkle it generously with salt and pepper. Rub pimentón on the inside (cut) surface. 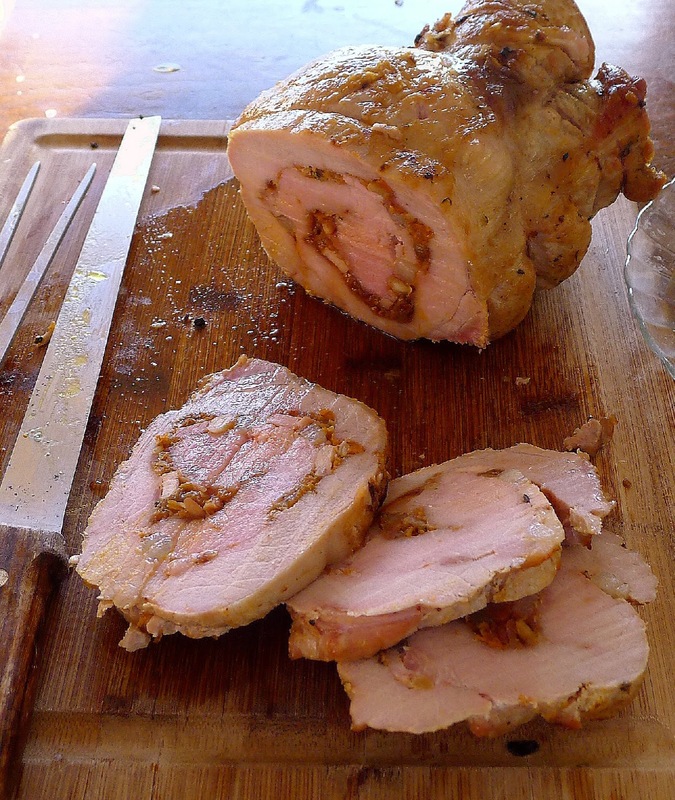 Roll the meat loosely and refrigerate overnight. Bring the meat to room temperature. Soak the raisins in the brandy 10 minutes. Heat 2 tablespoons of the oil in a skillet. Fry the pine nuts until golden and skim them out. Add the onions, carrots and garlic to the skillet and sauté slowly until softened, 10 minutes. Add the reserved raisins and pine nuts. Add the brandy, orange zest, rosemary and fennel. Cook 3 minutes. Remove from heat and add the chopped serrano ham. 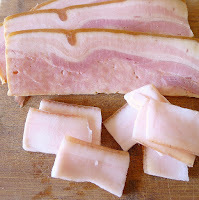 Use sliced tocino and/or bacon. Lay the meat flat, fat-side down. Spread the stuffing mixture over the surface. 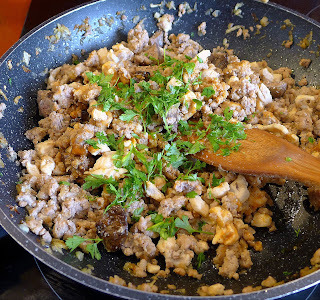 Lay strips of pork fat or bacon crosswise on top of the stuffing. (The 1/8-inch thick slices of bacon are cut crosswise into 2 ½ -inch long strips.) Roll up the pork loin around the stuffing. Tie with butcher’s twine. Brown the rolled loin before putting it in the oven. Heat remaining 1 tablespoon oil in a heavy, oven-safe skillet large enough to hold the rolled meat. Brown the meat on all sides. Add ¼ cup stock to the skillet with the meat. 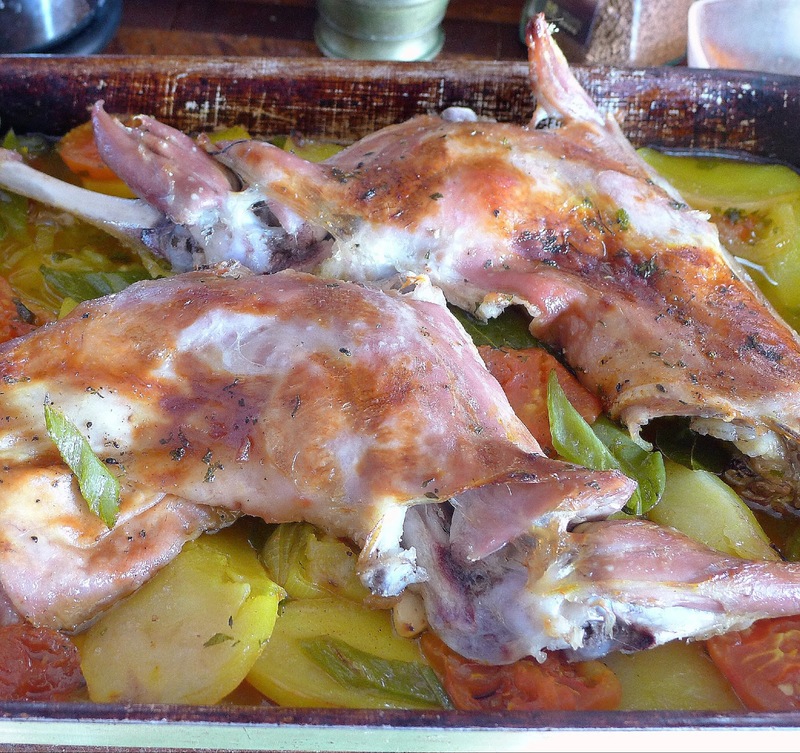 Place, fat-side up, in the oven for 20 minutes. Remove the meat from the oven. Turn the meat. Add additional stock if the liquid has cooked away. Return to the oven until meat registers internal temperature of 145ºF, approximately 20 minutes more. A serving for one, with lots more for another meal when the family returns. 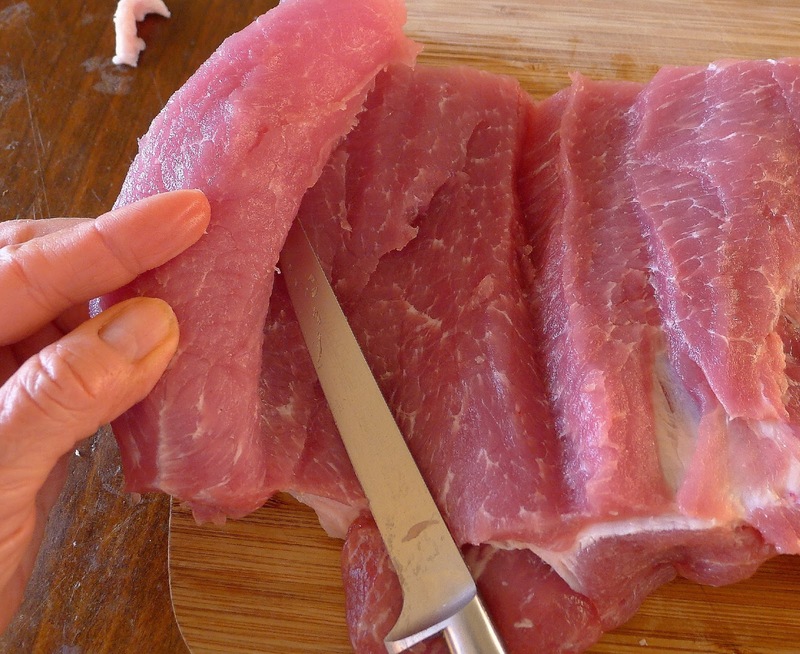 Remove meat to a cutting board and let it rest 10 minutes before removing string and slicing. Add any remaining stock to the skillet, bring to a boil, scraping up the drippings. Spoon some of the juices over the meat. A festive dish: Partridge in escabeche with quinoa salad. And, guess what? The partridge comes out of a can! Garnishes make it special--"teardrop" red peppers, "pearls" of extra virgin olive oil, sliced hard-boiled quail eggs. Here’s a novel idea for planning your holiday menus—start with the garnish, the finishing touch that makes a dish special. I shopped around, pulling jars, cans and packets off supermarket shelves, to select ingredients that would add a pop of color or punch up the flavor of simple foods. Some of them were pricey, gourmet products; others were as basic as a handful of fresh parsley or a tin of smoked pimentón (paprika). All of them were produced in Spain. Back in my kitchen, I planned dishes to go with the garnishes. 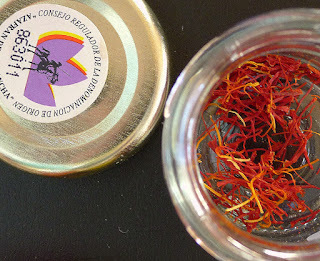 Some of the ingredients I collected: orange-flavored salt flakes (Alicante), olive oil “pearls” (Jaén); sea urchin roe (Gijón, Asturias); black garlic (Las Pedroñeras, La Mancha); partridge in escabeche (Ciudad Real, La Mancha); “teardrop” red peppers (La Rioja); saffron with D.O. La Mancha; smoked picante pimentón with D.O. 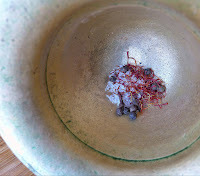 De la Vera (Extremadura); purple carrot jam (Cuevas Bajas, Málaga), and purple Empeltre olives (Aragón). Aperitifs, for a drinks party or the anticipatory hour before dinner is served. Fino Sherry or Manzanilla is the perfect drink. Bubbly cava is good too. 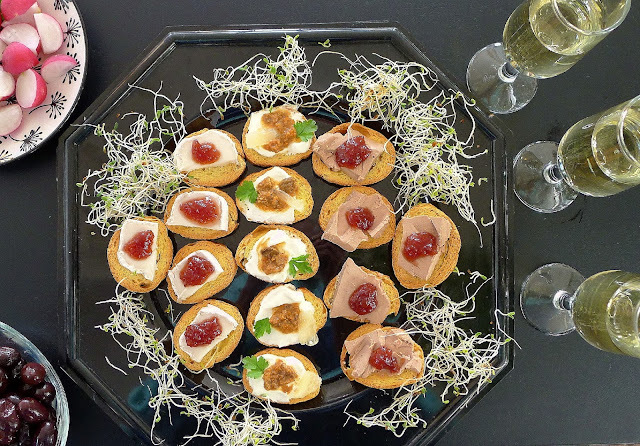 Easy canapés--duck liver pâté, goat cheese and sea urchin roe with sour cream on crispy (packaged) toasts. 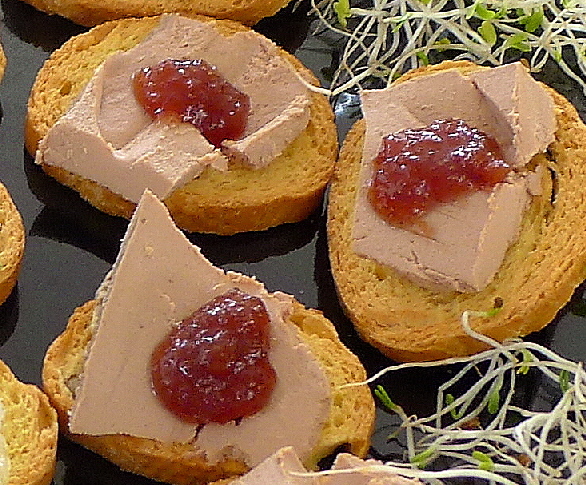 A dab of purple carrot jam (mermelada de zanahoria morá) complements both the pâté and the cheese. For garnish, try alfalfa sprouts, sliced radishes, black olives. Sea urchin roe doesn't look like much, but packs a walloping big flavor. Place a small spoonful of the roe with sour cream and a sliver of lemon on toasts. Starters. 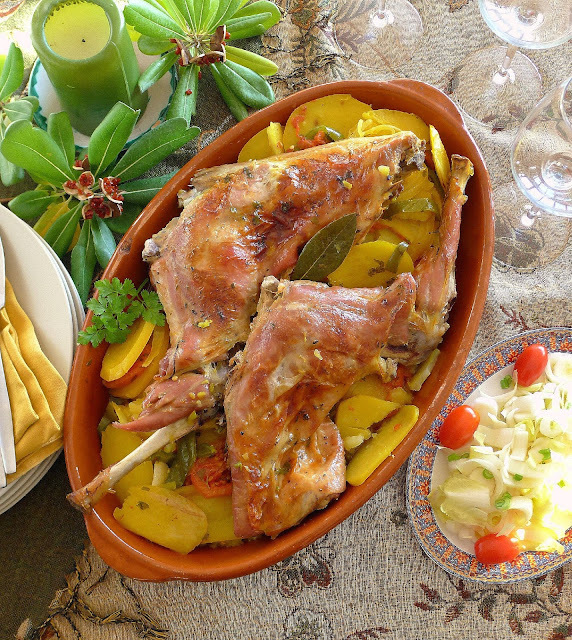 Fish and shellfish are traditional for the Spanish Christmas Eve meal. Soups and bisques are perfect starters on wintry days, but salads are a light entrée to a main course. A seasonal salad--two kinds of citrus fruit, kiwi and avocados--with langostinos, large shrimp. The finishing touches are tangy purple-black Empeltre olives and crunchy salt flakes infused with orange zest. Fancy flavored salt is a great final touch. This one, from Alicante, is infused with orange zest. The crunchy flakes add textural interest to foods. 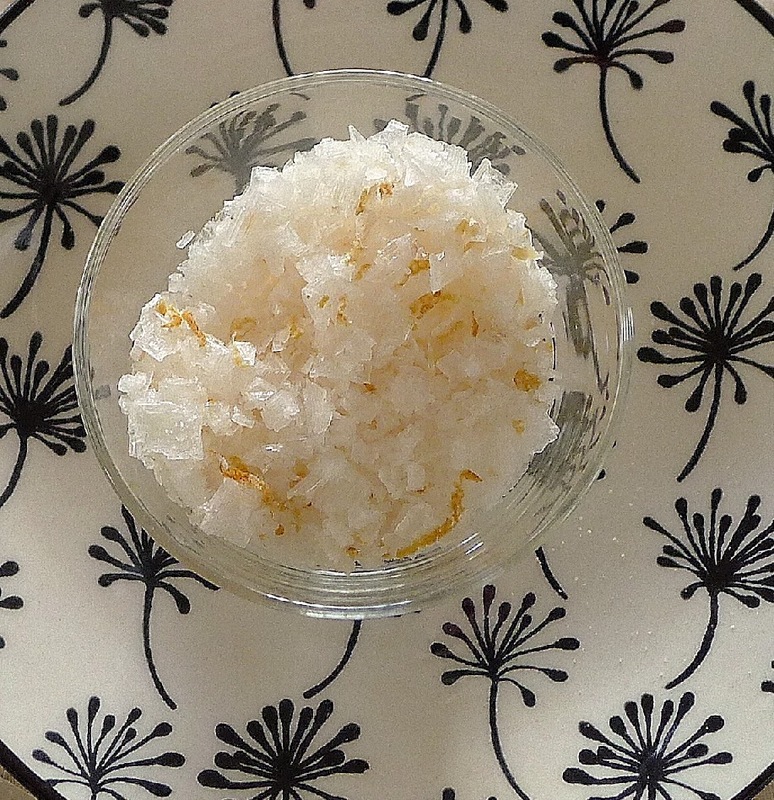 Some imported salts are also visually thrilling--the black Hawaiian or Himalayan, for instance. White asparagus bisque is gilded with wisps of saffron. 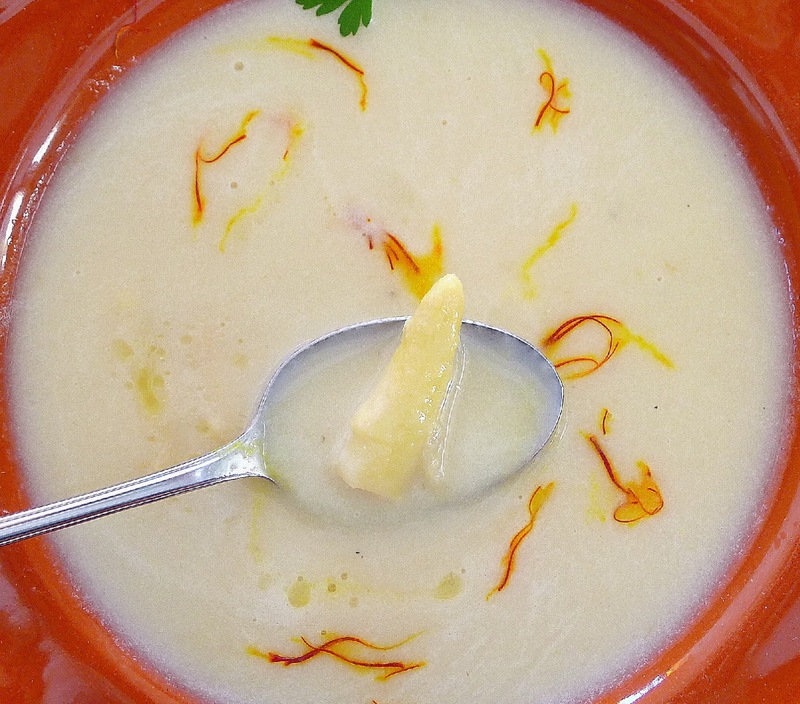 Another last touch; a spoonful or two of fino Sherry to add depth of flavor to the soup. Side dishes. An inspired garnish turns ordinary potatoes and vegetables into value-added dishes. Are those truffles? Nope. They are cloves of sweet black garlic studding a savory dish of cauliflower in almond sauce. And, that's not just any red paprika sprinkled on top. It's smoked pimentón de la Vera, this one picante, or spicy-hot. Black garlic is ordinary garlic that is "aged" in humid conditions, causing a sort of fermentation. Inside the skin, the white cloves soften and turn black. Black garlic has an amazing sweet taste, without the "bite" of fresh garlic. It can be used whole or mashed to a paste. With oil for a baked potato, on pasta or steak. It is sold, peeled, in jars or in whole heads, as shown in the photo. Main dish. Quinoa is the basis for this main dish salad that can be vegetarian or not. 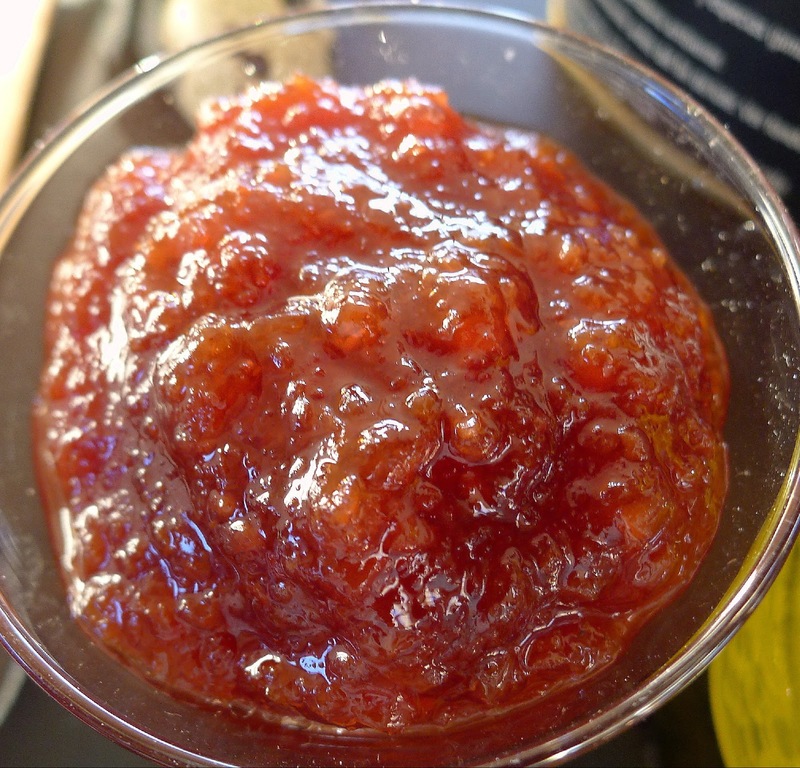 It gets festive treatment with bright red piquant peppers and tiny "pearls" of olive oil. 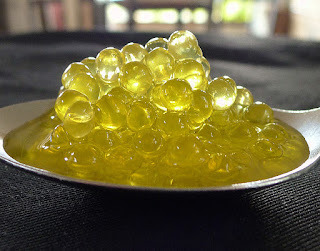 The pearls are tiny transparent balls that burst when you bite into them, releasing a drop of extra virgin olive oil. Festive treatment for quinoa--red "teardrop" peppers and tiny pearls of encapsulated olive oil. 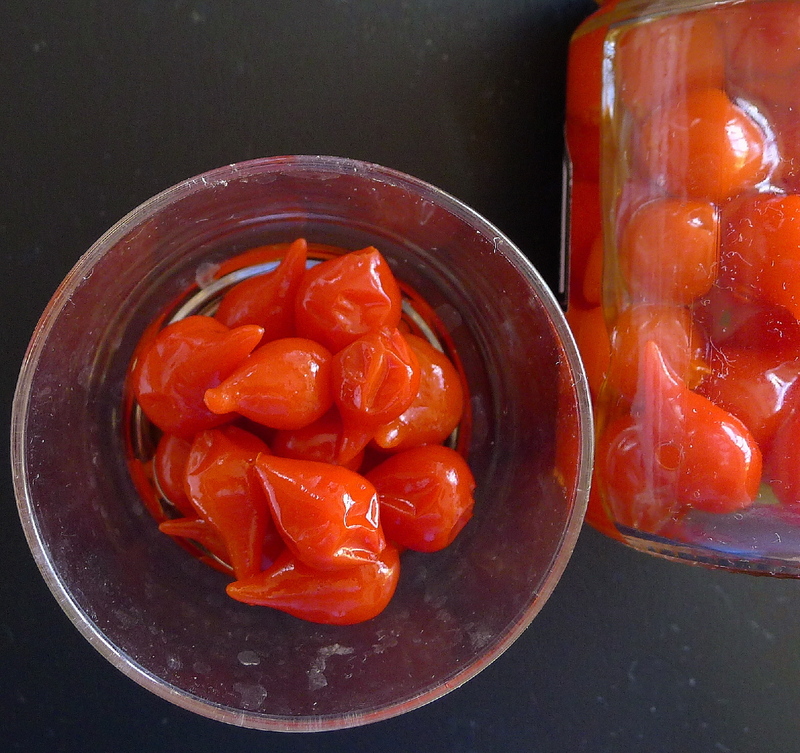 "Teardrop" peppers from La Rioja are sweet and piquant. 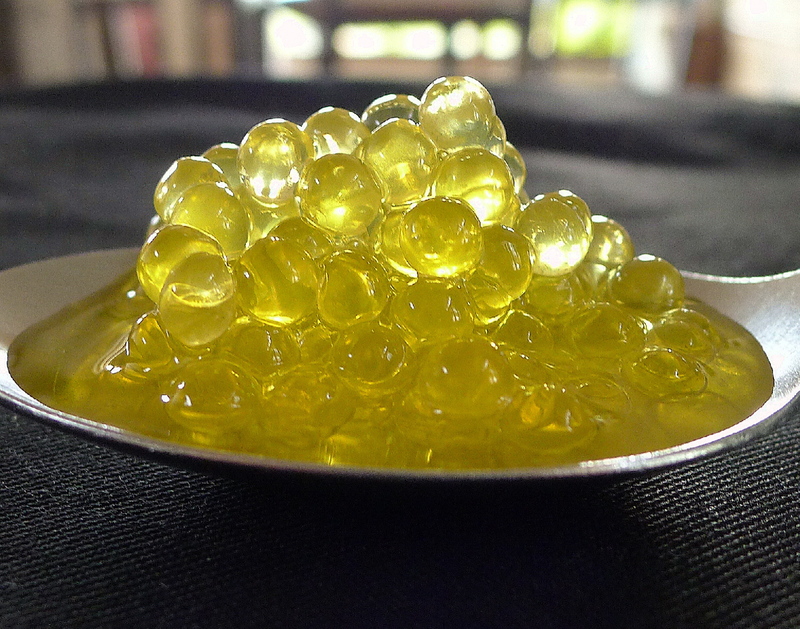 Tiny pearls of olive oil do not need refrigeration. They are sold in jars. Use them to garnish any dish. Canned asparagus may seem very mundane. But in Spain, white asparagus is considered a luxury and appears in holiday gift baskets and as a garnish for special salads. Here it is cooked in a smooth bisque, with the tips to garnish the soup. The finishing touch: a spoonful or two of dry Sherry to give depth of flavor to the soup and a scattering of golden saffron on top, for color and inimitable aroma. This makes a lovely starter for a holiday meal. Drain the cans of asparagus, saving 1 cup of the liquid. Cut the tips off the asparagus and reserve them. Chop the spears. Heat the oil in a soup pot. Sauté the leeks, shallot and garlic on medium heat until softened, 5 minutes. Add the chopped asparagus spears, zucchini and potatoes and sauté 3 minutes. Add the reserved asparagus liquid and the stock. Add the sprig of parsley and salt and pepper to taste. Bring to a boil and cook gently, covered, until vegetables are very tender, about 20 minutes. Let cool 15 minutes, then puree the soup in a blender. Add the cream or evaporated milk and blend again. . Shortly before serving, reheat the soup, but do not boil. Add the Sherry. Serve the soup into shallow soup bowls. Divide reserved asparagus tips between the bowls. Scatter saffron on top of the soup. Add a generous sprinkling of salt flakes to the salad. On my way to the market the other day, I passed beneath a balcony where a woman was leaning out, telling a guy in the street below how to make her special salad for the cena de Noche Buena (Christmas Eve dinner). 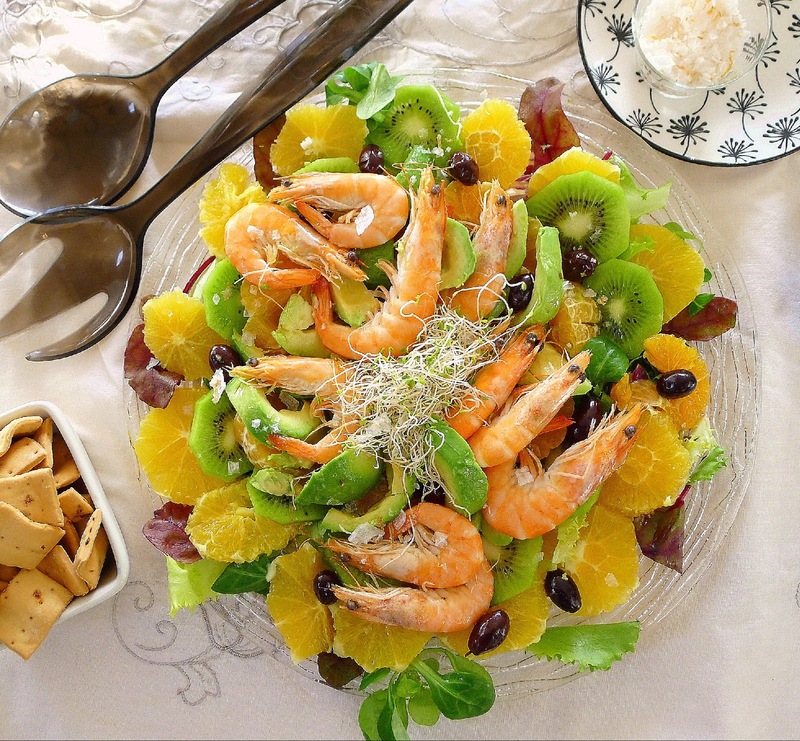 Seasonal fruit, she said, avocados, oranges, clementines, kiwi and olives, sliced and arranged on a platter and topped with bocas de mar, imitation crab sticks made of surimi. I asked her what the salad was called. “I named it ensalada flamenca,” she said. It is so traditional to serve fish and shellfish for Christmas Eve celebration. But, my version would be with langostinos, big shrimp, instead of the fake crab. For showiness, I left the shrimp whole, to be peeled at the table. But, for ease of serving, you could remove shells before adding to the salad. Other shellfish can be used as well. The finishing touch: Instead of the local olives, cracked green ones with thyme and garlic, I used purple-black Empeltre olives from Aragón. And for crunch, orange-flavored salt flakes generously sprinkled over the whole salad. Cook the shrimp in boiling, salted water with a bay leaf until they turn pink and begin to curl. Drain and plunge the shrimp into ice water to stop the cooking. Drain. Refrigerate until ready to assemble the salad. Peel and slice the oranges, clementines, kiwis and avocados. Place salad greens on a serving plate. Arrange the fruit in a single layer on top. 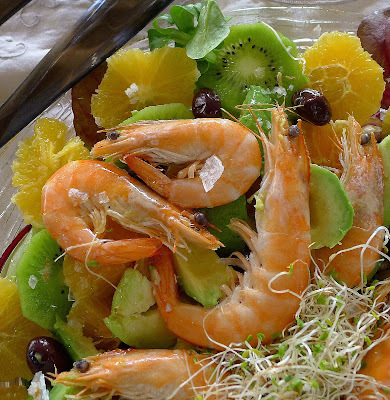 Place the shrimp in the center. Garnish with olives. Sprinkle the salad with the salt flakes. 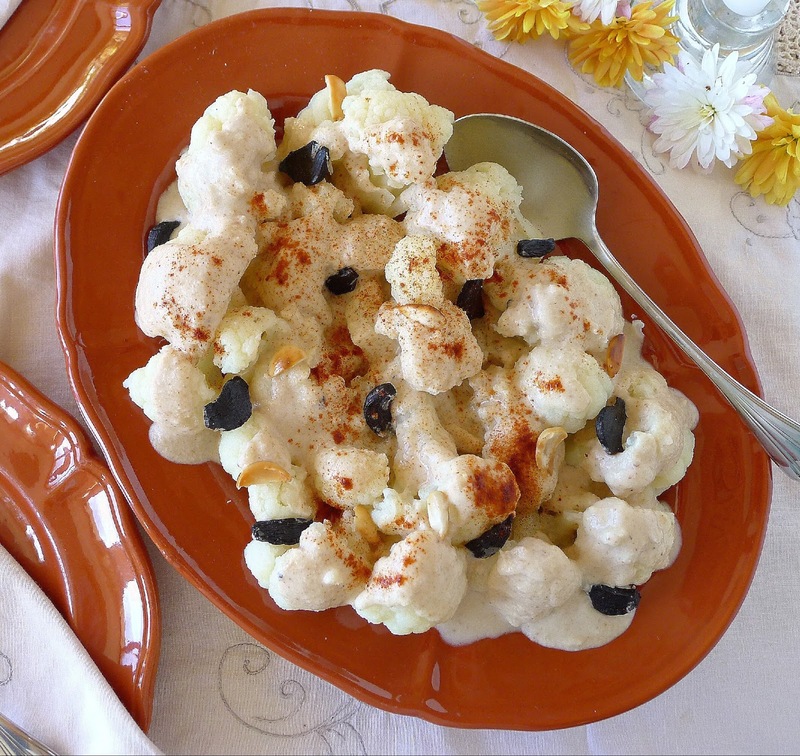 Cauliflower with almond sauce is a very traditional side dish for the Christmas Eve meal. 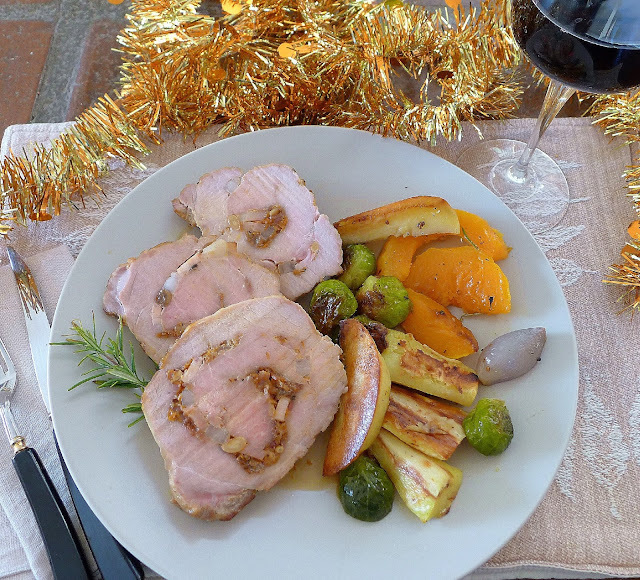 The almond sauce can be used with other vegetables as well. If you make it with vegetable instead of chicken stock, it makes a really good vegan gravy. 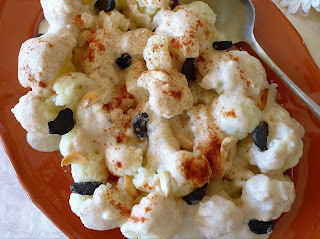 The final touch: stud the creamy cauliflower with cloves of coal-black garlic, then dust it with deep red pimentón. A side dish with dramatic impact! 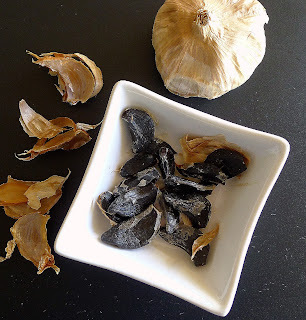 The black garlic requires no cooking. Just peel the individual cloves and add to the cauliflower immediately before serving. Heat the oil in a skillet. Fry the bread, almonds and 2 cloves of garlic, turning, until they are golden. Remove them. Reserve a few of the almonds to use as a garnish for the finished dish. Add the remaining almonds, bread and garlic to a blender. Add some of the stock. Blend to make a smooth paste. Stir the paste into the skillet with the remaining stock. Season to taste with salt and pepper. Cook, stirring, until sauce is thickened and smooth. It should be the consistency of cream, thick enough to nap the cauliflower. If too thick, add additional stock or water. Place the cauliflower in a bowl or spread it on a platter. Slice the reserved fried almonds into slivers and scatter them over the cauliflower. Stud the cauliflower with cloves of black garlic. Finish with a sprinkle of hot pimentón. One partridge in escabeche is boned and divided between four salads. 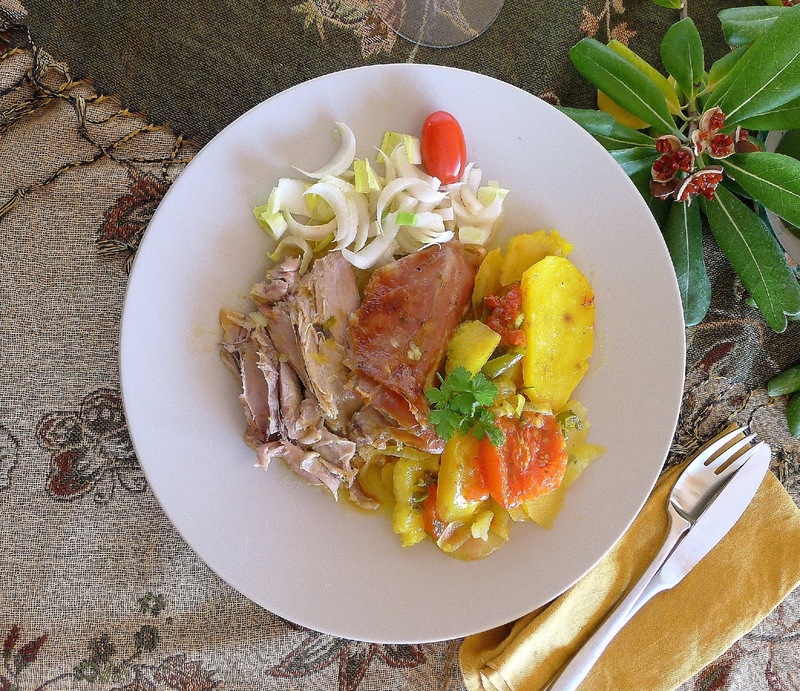 This salad features canned partridge in escabeche marinade, a traditional way of conserving partridge in La Mancha, where the wild game bird is abundant. 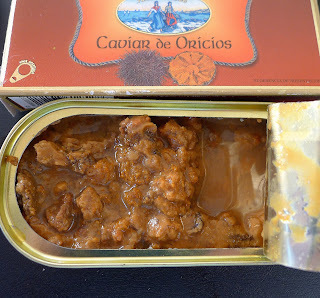 (The canned partridge usually is produced with farm-raised birds.). Allowing one bird per person, this salad makes a main course dish. Boned, it can be divided between four salad servings. You can use the escabeche marinating liquid to dress the quinoa instead of the oil and vinegar called for in the recipe. 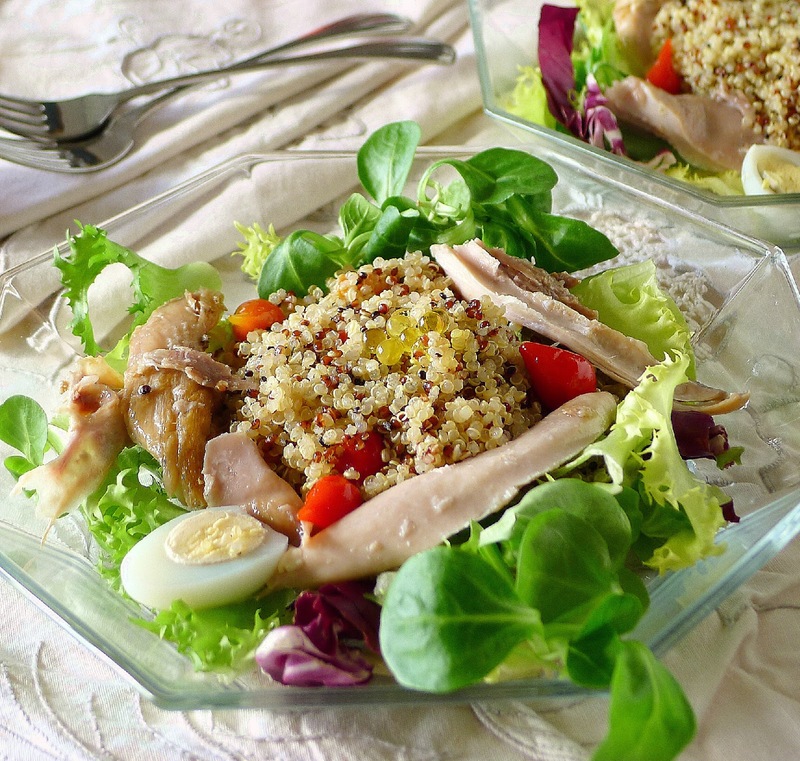 You will have more quinoa salad than needed for four servings. The final touch: little sweet and piquant “teardrop” red peppers add a pop of color to the quinoa salad. (Substitute chopped red piquillo peppers if the teardrops are not available.) Olive oil pearls on top give a touch of luxury. Oh, and some cute little quail eggs make the salad more fun. 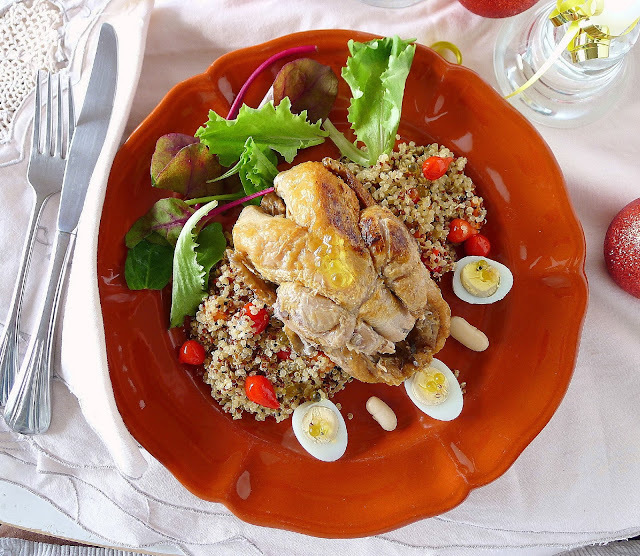 Serve the quinoa and partridge at room temperature. Cook the quinoa and carrots in boiling water with ½ teaspoon salt (approximately 12 minutes). Drain well and place the quinoa and carrots in a bowl. Add the oil, vinegar, pepper and ½ teaspoon salt. Stir in half of the red teardrop peppers and a pinch of thyme. 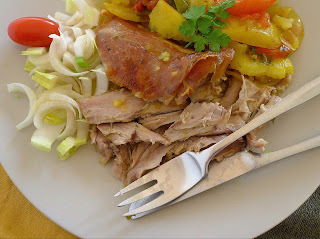 Drain the escabeche liquid from the partridge. Carefully de-bone the partridge, keeping pieces of meat as large as possible. Make a layer of salad greens on individual salad plates. Place a mound of the quinoa in the center. 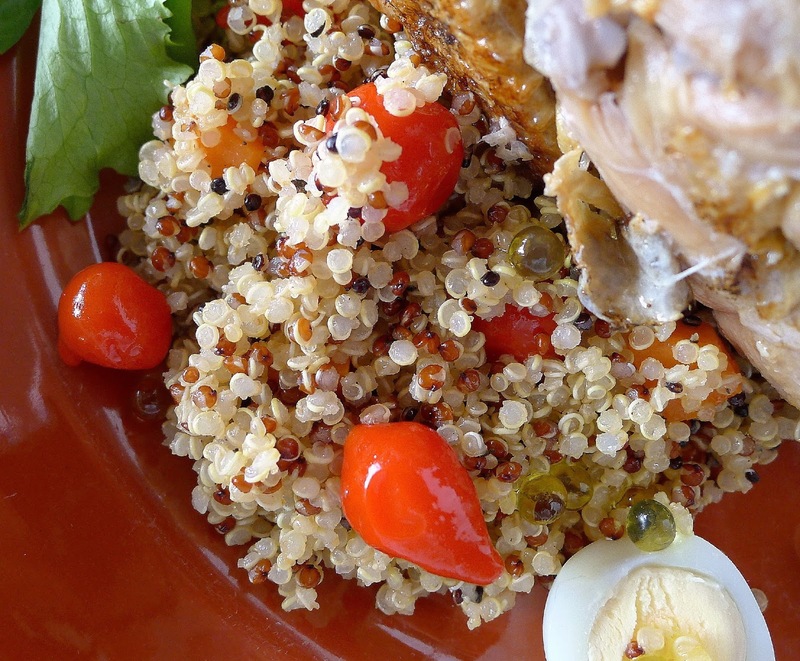 Lay pieces of partridge around the quinoa. Garnish each salad with a few teardrop red peppers. Peel and halve the quail eggs and put one or more halves around the salad. Put a spoonful of olive oil pearls on top of the quinoa. Purple Carrots with Raisins and Pine Nuts. Saffron Ice Cream with Chocolate Sauce. Is this what's for Noche Buena dinner? Baby kid roasted with potatoes and vegetables. 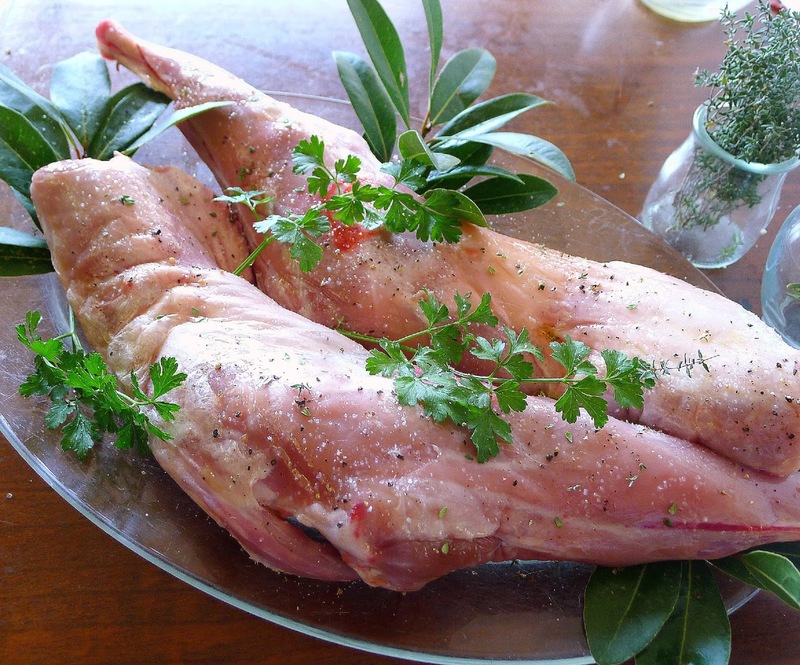 Early on in my life in an Andalusian village, I was shocked to see in the local butcher shop, ten tiny baby goats, still unskinned, hanging by their hind legs from a long rack. Straight from “pre-packaged” American supermarkets, I was disconcerted by meat in such a primary state. Nor had I ever eaten goat. At that time, several herds of goats were stabled in the village. In the morning, the cabrero led his goats—brown, grey, and dappled—through the village streets, their small bells tinkling as they passed. In some doorways, a goat would come tripping out of the house to join the herd on its day´s outing to graze in the countryside. At another, a housewife stepped into the street with a pail. The cabrero called to one of his flock, “Rosita, ven p’ acá." One of the goats separated herself from the herd and the goatherd, squatting in the street, milked her right into the pail. After the herd passed, I could still smell their presence. When the kids are born, baby males are culled (they aren't good for much except meat), while the females grow up to be dairy goats. That’s why baby kid was seasonally available from the butcher. It was especially appreciated for the feast of Noche Buena (Christmas Eve). No goat herds reside in the pueblo nowadays, though some are stabled below the village. Refrigerated trucks pick up the milk and carry it to cheese makers elsewhere in the province and much farther afield (France). I never see the meat in my local market and hadn’t eaten it in years. 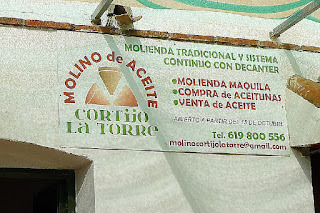 In recent years Chivo Lechal Malagueño (baby kid from Málaga) is being promoted and sold in some markets and via an internet site. (Chivo and cabrito are both words for kid-goat.) I sampled a whole goat menu at a local restaurant (goat chorizo, unctuous with ibérico pig fat; goat’s milk croquettes; fried kid riblets; roast leg of kid (cooked sous vide); and arroz con leche, rice pudding made with goat’s milk. That inspired me to cook kid-goat at home. I found this meat quite expensive (€18 per kilo or about $9.65 per pound). I bought a whole rear half—two legs and the attached loin sections. This provided four generous servings. It would be a stretch to serve six. The meat is very delicate in flavor, somewhere between suckling lamb and young veal. It is very lean, so has a tendency to be dry. The kid cooked sous vide at the restaurant was juicier than my roasted rendition. 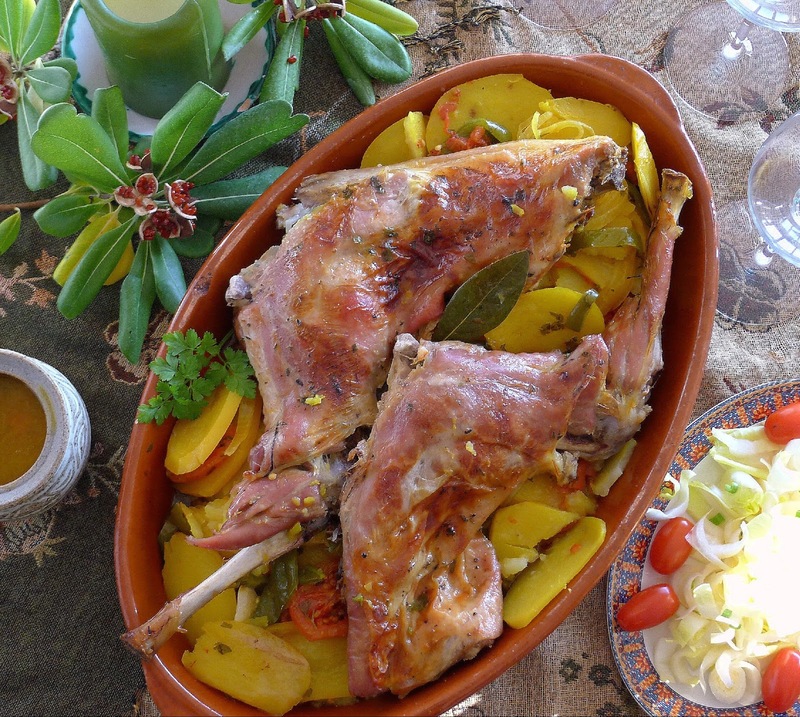 Baby goat, food for a festive occasion. Potatoes and vegetables cooked in wine with the kid are fabulous. Saffron gives them a golden hue. Kid is "the other white meat." Tender, delicate, very lean. 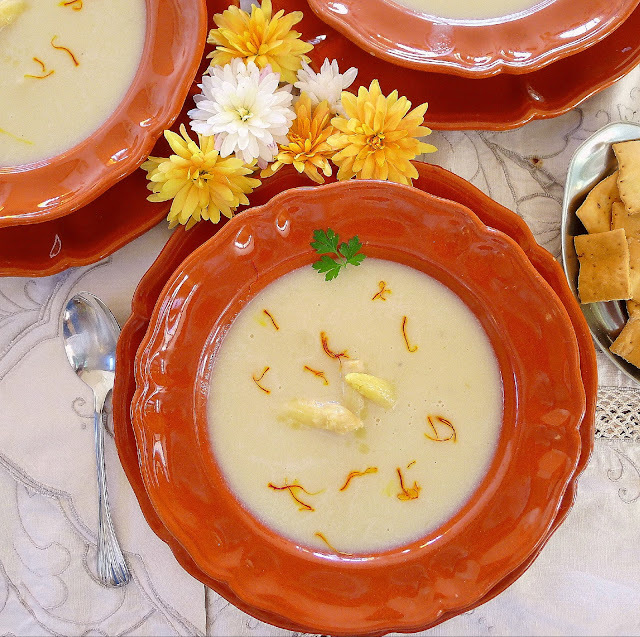 This dish comes straight from the campo, the countryside around Málaga, where it once was a favorite holiday or wedding meal feast. Prepared in a giant pan (1 ½ feet in diameter), the dish spends most of the day in the slow, fragrant heat of the bread-baking oven. For special occasions we would order the meal from a local bar. It consisted of a whole baby kid, hacked into fairly small pieces, layered with potatoes and vegetables in the big pan and baked at the local panadería (bread bakery). If suckling kid or lamb is not available, try this dish using lamb chops. Use more or less wine. Use chicken stock or water for the remaining liquid. Part way through roasting, check to make sure liquid still remains in the pan. 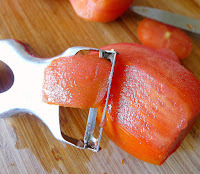 Peel tomatoes with a peeler. Peeling the tomatoes before slicing them means no annoying loose tomato skins mixed in with the yummy potatoes and vegetables. Use a vegetable peeler to peel firm tomatoes. To roast a whole head of garlic, spear it on a fork or grasp with tongs and turn it over a gas flame or put it under the broiler (grill), turning, until it is charred on all sides. Rub off the skin and peel the garlic cloves. Two back legs plus the loin sections, ready for the oven. Sprinkle the meat with salt, pepper and thyme and allow it to come to room temperature. 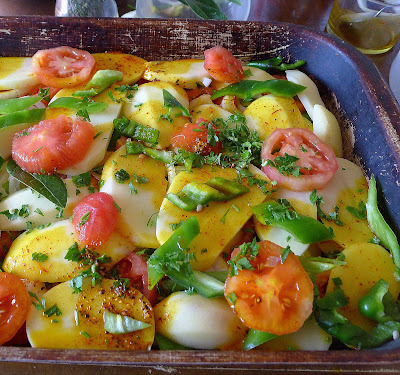 Spread half the oil in a roasting pan or large cazuela. Place a layer of onions on the bottom of the pan. Add a layer of sliced potatoes, strips of green pepper and sliced tomatoes. Sprinkle generously with salt and half of the parsley. 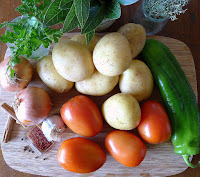 Continue with remaining onions, potatoes, peppers, tomatoes and parsley. Sprinkle with salt. Break the bay leaves in half and tuck the pieces in with the vegetables. Peel the cloves of roasted garlic and push them under the vegetables too. Layer potatoes, onions, green peppers, tomatoes and garlic in the bottom of roasting pan. Pour over spice mixture with saffron. Add oil and wine. Place the meat on top. In a mortar, crush the saffron with the coarse salt, peppercorns and cloves. Stir in the cinnamon. Stir in ¼ cup of the wine. Pour the spices over the vegetables. Place the meat, skin side down, on top of the vegetables. Pour the remaining olive oil over the meat. Roast the kid 15 minutes, then reduce oven temperature to 350ºF. Roast 1 hour more. Remove the pan from the oven. Turn the meat skin side up. Baste it with some of the liquid in the pan. If liquid has cooked away, add more water. Return the pan to the oven. Roast 30 minutes longer, until the meat is browned and potatoes are cooked. Kid and vegetables can be served straight from the roasting pan. Or, if preferred, remove them to a serving platter. Allow the pan to set 10 minutes before serving. The potatoes will absorb some of the remaining pan juices. If desired, remove meat and vegetables to a serving platter. Baked Whole Fish with Potatoes. First, pick the olives. Get them to the mill as soon after picking as possible. That way, they maintain their freshness and fruitiness and produce the finest virgin oil. 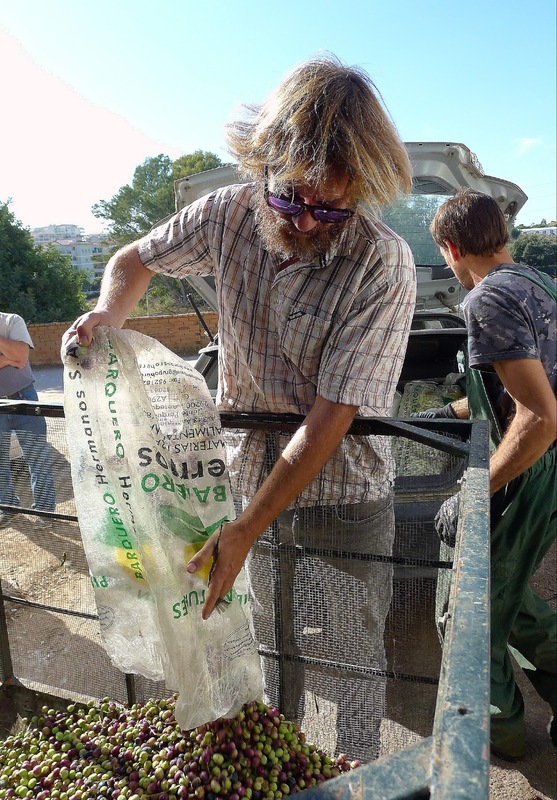 Unloading six sacks of my olives at the mill. This mill is a small, family run business only a few miles from where I live. Originally established in 1920, it stopped functioning in the early 1960s. Five years ago, the four Ayala brothers who own it decided to put the mill in working order again. A fork-lift loader moves my bin of olives to the loading chute. A week's worth of picking looks like nothing in that bin that holds 500 kilos! 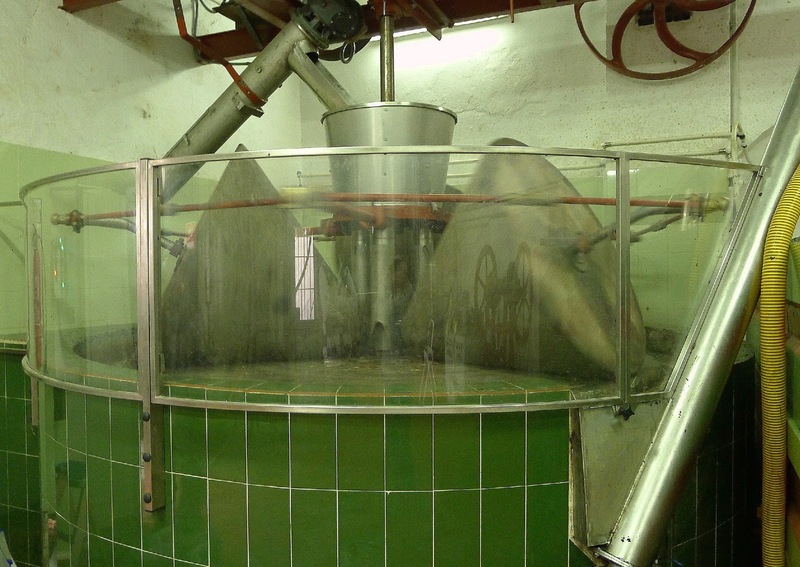 Off they go, olives on the way to becoming oil. 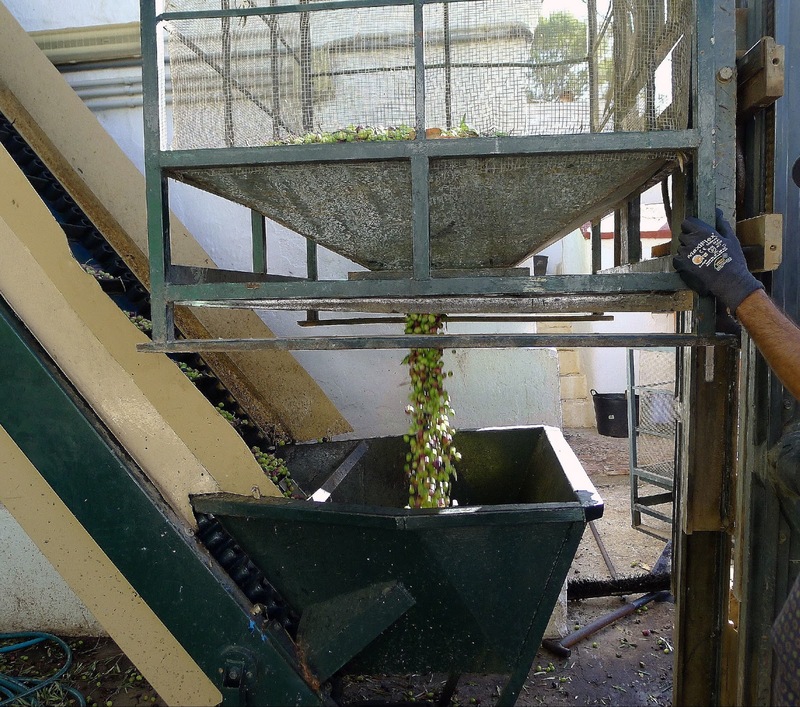 First step, the olives are tumbled and air-blown in a hopper to remove leaves and dirt. 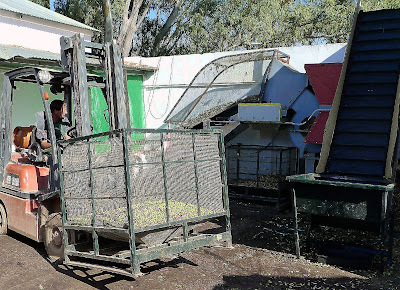 Large scale growers usually down olives by vareo, thrashing the branches with sticks and gathering the fruit in tarps spread on the ground. Inevitably, leaves and twigs accumulate with the olives. 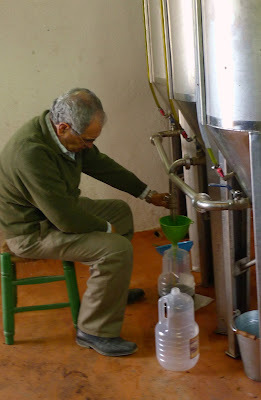 I hand-pick olives, ordeñando, or "milking" them off the branches. So my olives are especially clean. Sometimes the jefe decides they don't need the leaf-blower. The olives drop into a bin that functions as a scales. 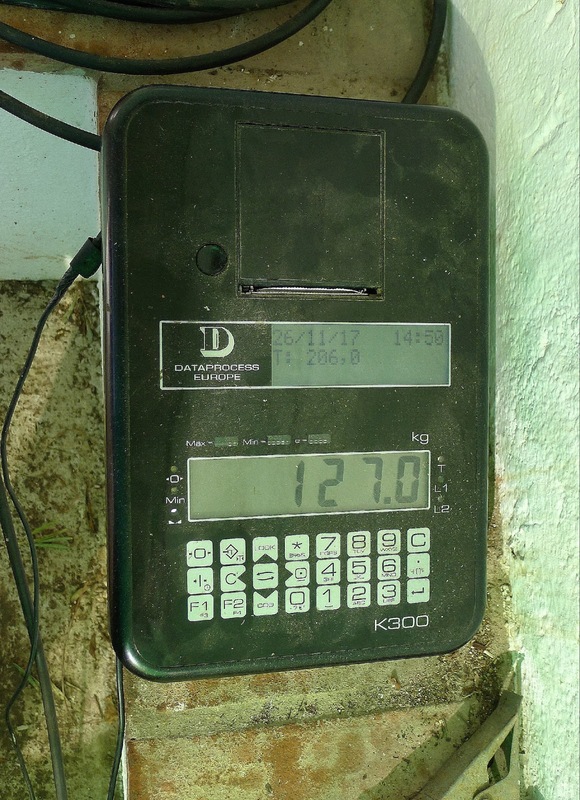 Weight: 127 kilos ((280 pounds). 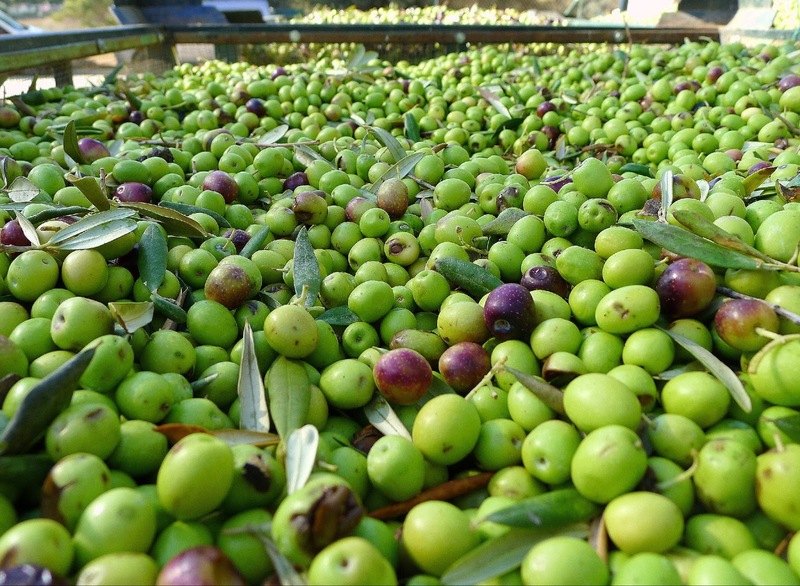 Harvesting of olives seems to begin earlier every year. Two factors are at work here. One, yes, global warming. The fruit matures earlier. As soon as the first rains plump the olives (October), they are ready to pick, green and fresh. 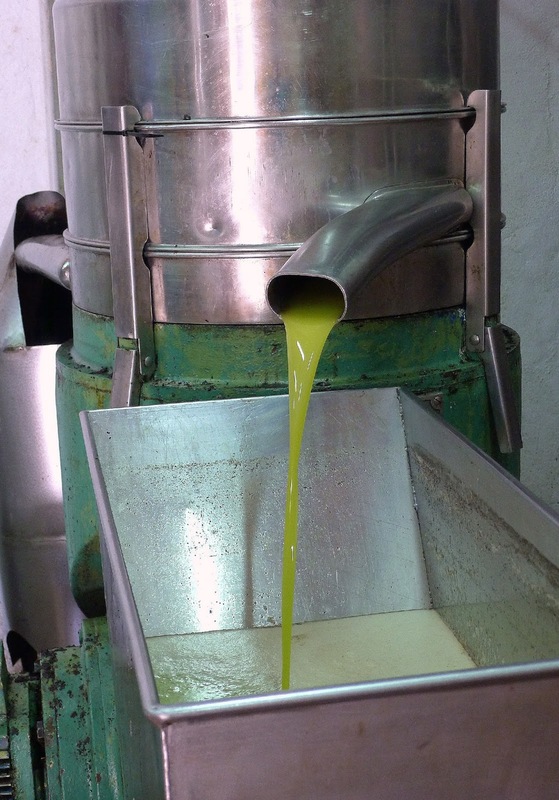 Also, early milling makes superior virgin oil. Virgin olive oil is oil that has been extracted solely by mechanical means--crushing and pressing, without the use of high temperatures or chemical disolvents that alter the oil's composition. It is almost the only oil that can be consumed without further refining. 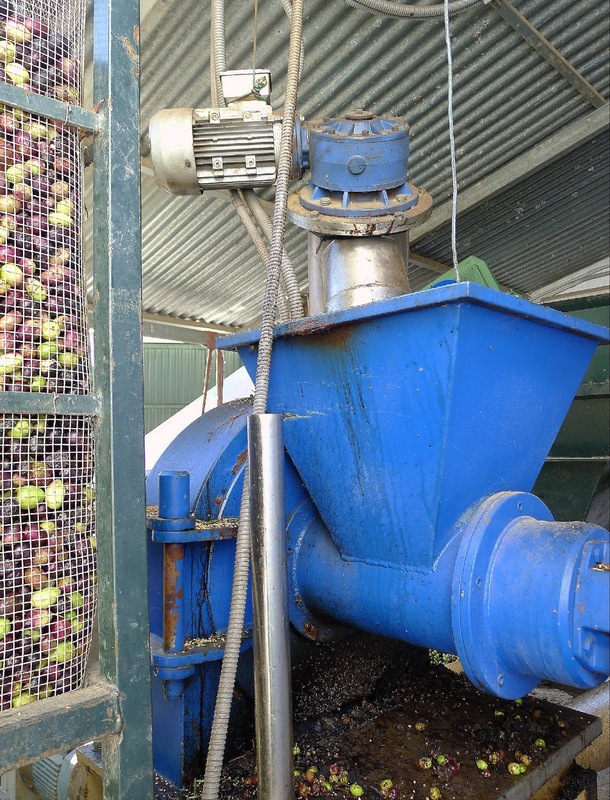 The next step, the olives are crushed to release the oil. This is the old way for molturación, with grinding stones. It is no longer used at this mill. "Not efficient," said the owner. 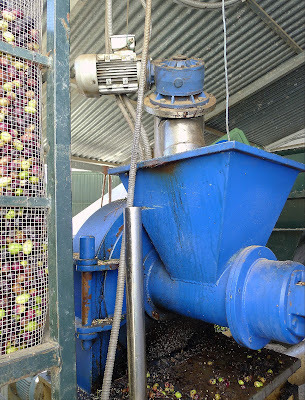 Instead, olives go into this machine to be ground up by spinning steel wheels. 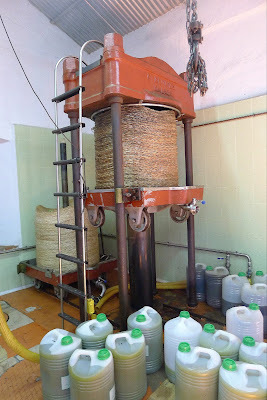 This is an old-fashioned olive press. 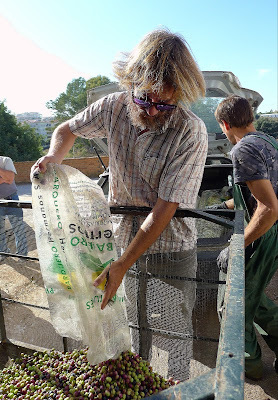 The ground-up olive pulp is spread onto mats, woven of esparto grass or of polyester synthetics. These are stacked on the hydraulic press, which squeezes the pulp tighter and tighter, allowing the oil to flow out through channels at the bottom. This mill no longer uses this press, except for special orders. 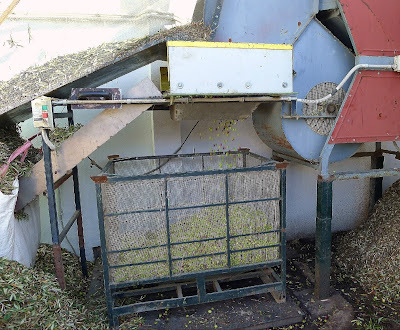 The reason these presses have fallen into disuse is that they produce less good oil. 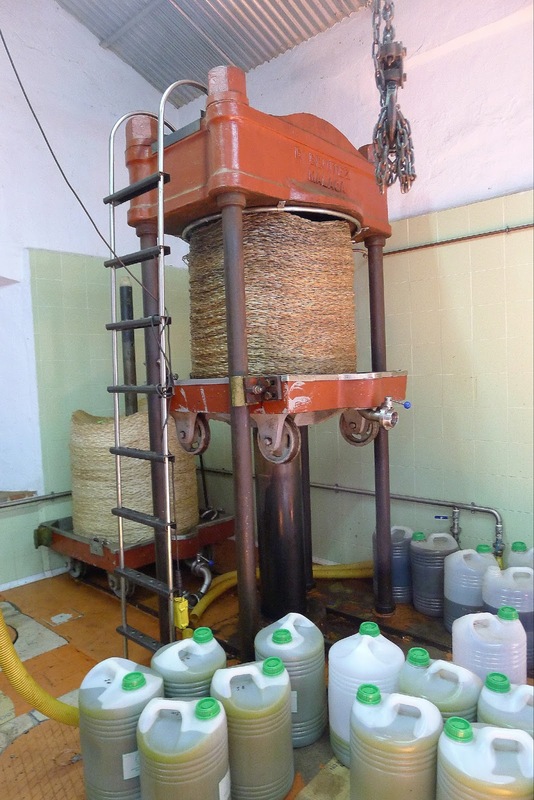 The mats must be scrupulously cleaned in order to prevent residue from causing rancidity and off flavors in new oil. 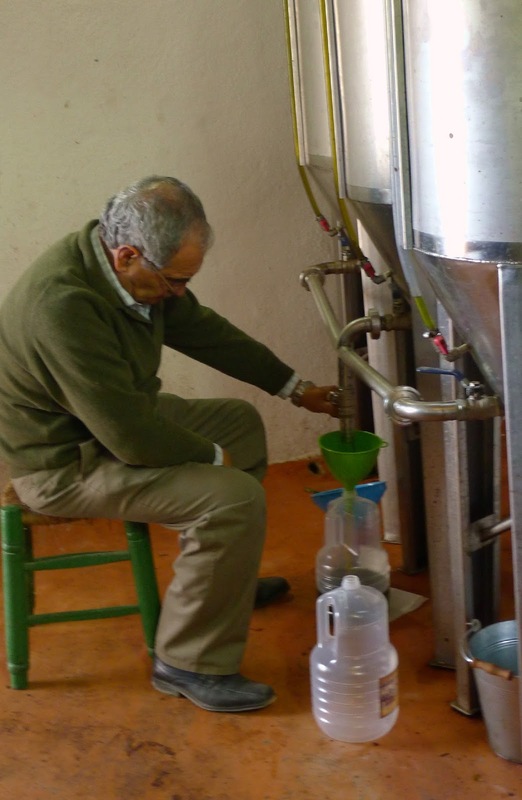 Jesús Ayala monitors a modern olive oil extraction machine. The crushed olives are spun at high speed to separate the oil from the water. Forget that old phrase, "cold-pressed oil." 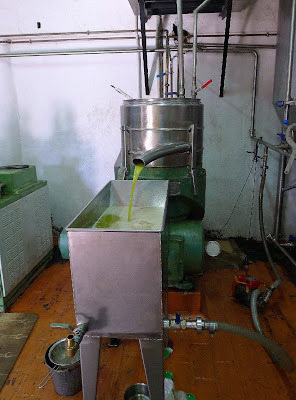 Almost all olive oil in this day and age is extracted by a centrifugal process. Big cooperative factories have huge ones. This mill has a small one. During the milling season, the Ayala brothers run it seven days a week. Straight from the centrifugal extractor, new oil pours out. 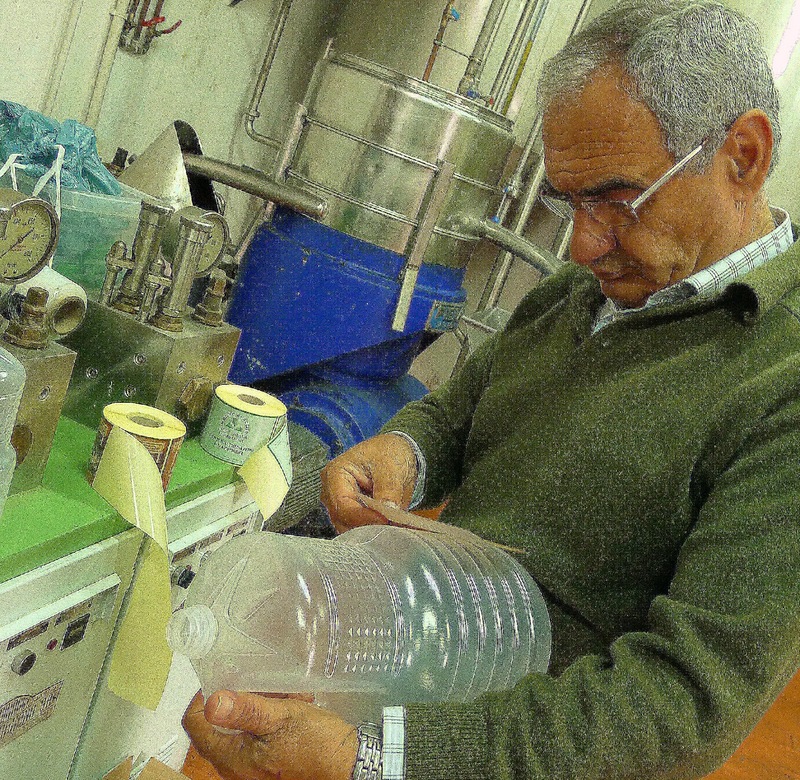 Fresh-squeezed olive juice. This oil is unfiltered. After settling a couple of weeks, it will clarify quite a lot. 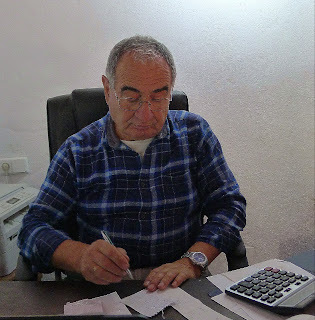 Modesto Ayala figures out how much I've earned. I could take the money--hardly enough to buy lunch! But, I want the oil. Fifteen liters, he tells me. This is not from my own olives--I don't have enough olives at one time for the "run of the mill" (500 kilos). Working by myself, with a little help from son and grandson, I can't pick enough in one week to make up the minimum. 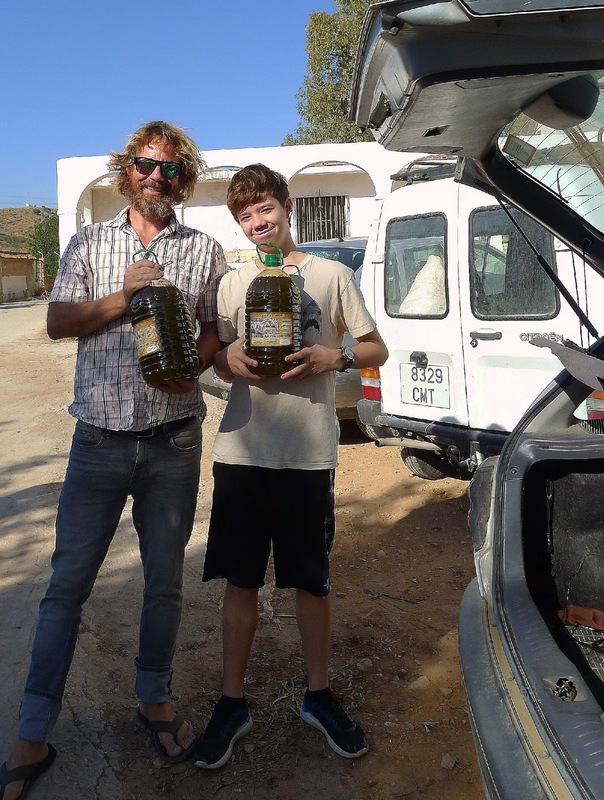 Ben and Leo load three 5-liter jugs of oil. I'm up to 35 liters now and still more olives to pick! Hopefully, we'll finish by next week. 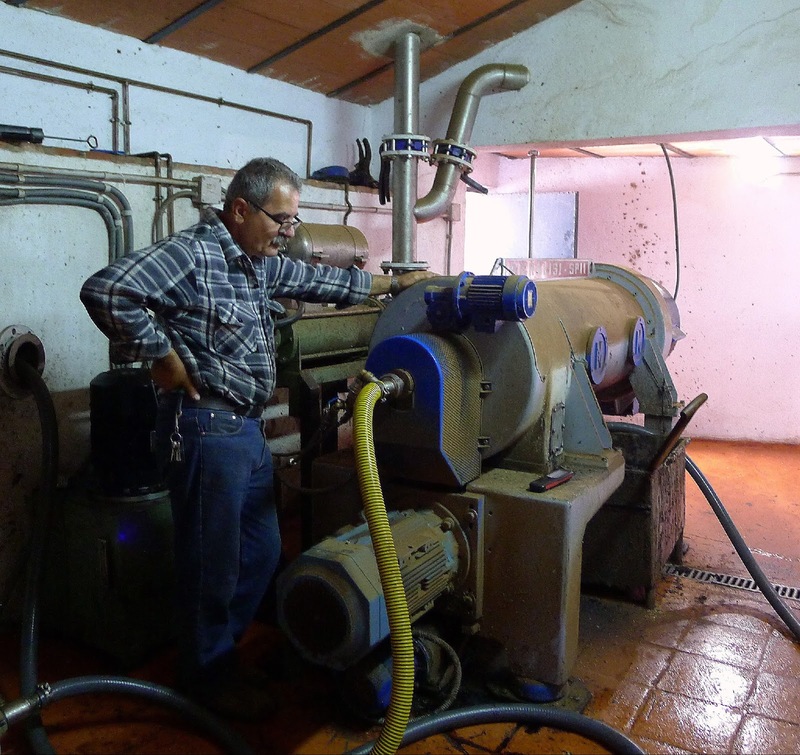 The olive mill of the Ayala family is located in Campo de Mijas (Málaga).